The winter semester can be a challenge — even at the very start. The weeks between the holidays and Spring Break tend to drag, and it doesn’t help that the sun is almost always hiding behind a wall of cloud. All work, no play, and not enough vitamin D make Jack and Jill a dull boy and girl. If your time on campus is starting to drag, check in with this quick gamer guide to SAD. It’s full of tips made for the gamer. SAD or Seasonal Affective Disorder has many names. Whether you call it the winter blues or the blahs doesn’t matter. If you have it, it can have a profound impact on your day-to-day mental health. Like its name suggests, it’s a type of depression linked to seasonal changes. In most cases, people with SAD start to notice symptoms in the fall, and they worsen over the winter. That’s because we experience fewer hours of sunlight during the winter. The winter is also a season when we do less and eat more. If you’re like a lot of people, you spent a lot of your winter break sitting around the couch and gorging on holiday treats. Moving less and eating heavier foods can contribute to your sinking mood and energy levels. Getting more sunshine — This may mean waking up earlier, spending more time outdoors, or studying near a big window. You may also want to consider a light box that mimics actual sunlight. Moving more — Physical activity may improve your mood and energy levels. Check to see if there are any classes or winter activities offered on campus or make use of the college gym. Eating better — In the winter, you may be all about eating those simple sugars and carbs, but these can leave you feeling sleepy and irritable. Try to eat more fruits and vegetables, lean protein, and whole grains. Socialize — It’s easy to isolate yourself when you’re feeling down, but the trick to beating SAD involves sticking together. Spending time with the people you love can improve your mood more than you realize. How does this work for the gamer? It may not come as a surprise to learn that getting enough sleep, working out, and eating right are at the top of psychologists’ list. Unfortunately, these ideas aren’t really made with the gamer in mind. Your favorite hobby is sitting in front of your Switch exploring Hyrule — not tooling around campus. 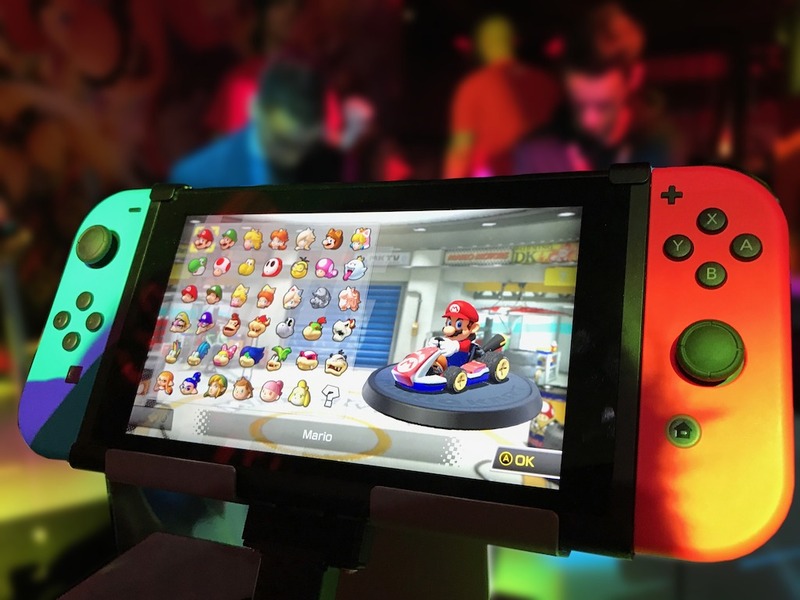 Although video games can often be a sedentary hobby, remember your Switch is a 2-in-1 console. You can use it like a normal at-home console, staring up at the screen while you play from the couch, or you can break it down into its Joy-Con, standing up and moving around to manipulate your player on the screen. This isn’t to say you have to put away your other favorite games and play only these active ones all winter long. However, it’s a good idea to switch to these games when you’ve gone too long without moving around. Just be aware of the dangers of using your Switch as an exercise tool. You’ve probably heard of the people who’ve thrown Joy-Con or Wii controllers at the TV while playing the more active games. Not only is this incredibly embarrassing, but this can break your TV! Be careful when you use your system this way. It may also be a good idea to wrap your Joy-Con with Nintendo Switch skins. By adding a Switch skin, you’ll be able to keep a better grip on your controllers. These decals are made from texturized 3M vinyl when you shop from a company like dbrand, so you’ll have more to hang onto than the smooth plastic of the Switch. You’ll be able to game harder with quality skins wrapped around your Joy-Con. The Switch is also a naturally social system. So be sure to invite friends over whenever you’re feeling like challenging someone to a game of ARMS. Having them over to race around the Rainbow Road is a great way to blow off steam, too — even if you aren’t moving around or working up a sweat. When you find time to enjoy the things that make you happy with friends your body releases feel good hormones that naturally boost your mood, like dopamine, serotonin, and oxytocin. How people go about chasing the rush of these chemicals will be different for everyone, but it amounts to the same thing: you’ll feel better prepared for the rest of the semester. For the gamers on campus, your Switch is an essential survival tool. They can help you blow off some steam and keep our sanity when the semester gets tough.